We’ve been enjoying summer here. June was quite full, but in all the best ways. But as the month started to wind down and I began to think of July and how July would mean we’re in the middle of summer. The middle of summer means that August would be here before I know it and August means…back to school. Tightness in my chest at the thought of school. Overwhelm at materials to prep. Suddenly, summer had lost its allure and rest and I dove head first (sunk really) into the worry and the overwhelm of all that is before me. My mental calendar piled high with everything I left unfinished last year and all I have to prepare for the coming school year. I was a wreck. In my mind, summer was over and I was headed straight for a marathon of prep work. It’s amazing how fast something can steal our joy, isn’t it? Then one night this weekend, I had a moment of clarity. I only had to do one thing to start. Just one thing. So I started with first things first. First, when are we going to start our school year? I pulled out my 2017-2018 School Year at a Glance (free download below), my personal planner, and our local school district’s calendar and started brainstorming dates. Should we start in early August, mid-August, or late August…September? I also consider our state’s homeschooling requirements (180 instructional days) and average how many days per month that breaks down to. Then I take out my highlighters and mark a color each for school, holidays, vacation, CO-OP (for us, it’s our Wild + Free group), field trips, and planning days in my planning key. Should we school year round? Plow through from August to November–break for Thanksgiving and then wade back in briefly before the holidays? Maybe 6 weeks on, 1 week off? After Christmas last year, I realized that I needed more of a break than a 3-day weekend here and there or waiting until Christmas break for two weeks. I’d get behind on regular household chores, find projects piling up in the corners, and just long for some alone time that was more than 30 minutes. And it seemed the kids might benefit from some lazy days and a break from routine. We switched to a 5 week on and 1 week off schedule built around holidays so we end up having 3 weeks off for Christmas, a week for Thanksgiving, in February (around President’s Day), and Spring Break. It does mean we end up finishing school in the beginning of June, but it feels worth it knowing we’re taking our time to not only learn, but rest and rejuvenate. After the calendar basics were on paper, I began brainstorming what we would study. 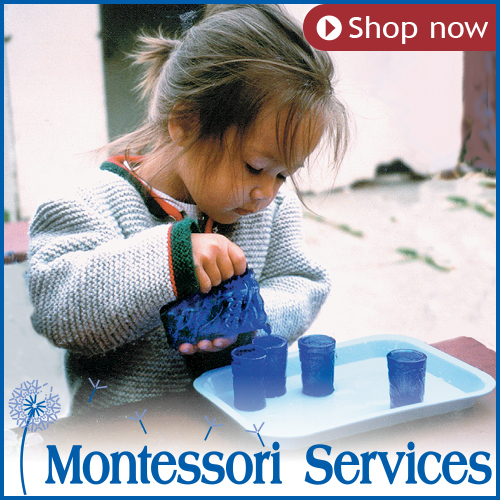 We follow the Montessori Scope and Sequence from my NAMC albums, which takes a lot of guesswork out of planning. 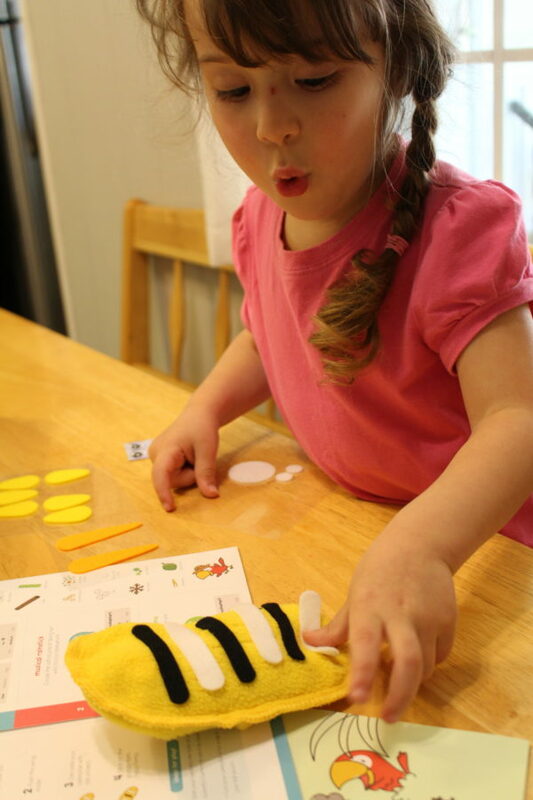 Language, math, and penmanship are all taught one-on-one wherever the child is on the sequence. Language, math, and penmanship are all taught one-on-one wherever the child is on the sequence, so those I’ll plan a little later when I have time to look more specifically at each child’s needs. But History, Geography, and Science we do all together. I know what topics we haven’t covered in the lower elementary material, so I spaced those out over our six terms. But know that I know when we’re starting, where our breaks will be, and what our overall plan is…the rest is not as anxiety producing as it once was. 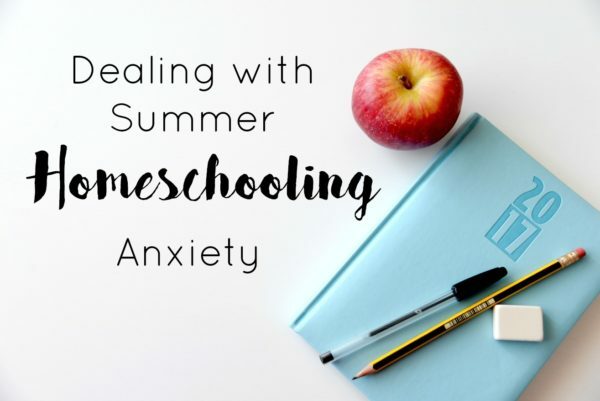 What homeschool prep is causing you anxiety this summer? How can you knock down your first obstacle? It’s that time of the year. Parents either love or hate summer. Maybe it’s the extra pressure to perform and create a Pinterest-worthy summer or the constant presence of your kids or the lack of your usual routine. Maybe you love summer and bloom with the free-flow of it all. Or maybe you have your summer bucket list and your pool bag packed and sitting by the door. Whichever way you lean, summer brings its own joys and struggles, but with a little planning you can craft a summer that meets your family. Before you jump in to your regularly scheduled summer routine and programs, take a week or two after you’re done with school to just decompress. Rather than go from one scheduled season to another, take a break to allow yourself and your kids the freedom to just do what you want, what comes naturally. Have a few anchors in your day (meals, outside time, quiet time, etc), but give yourself (and your kids) permission to just play or read a book for a couple of hours, cook simple meals, sleep in late, and skip a few chores. Parents and kids alike need that break. Then also, we can see what rhythm our family is naturally leaning toward and what are needs really are, rather than have a set schedule we’re trying to fit in that may or may not work. 2. Build rhythms and routines. As you’re decompressing, take a few mental notes to jot down what you’d like to do for the summer. What are you goals for your family as the parent? What areas you want to grow in or things you want to experience or create? How do your weeks naturally flow? Is there a big difference between your school year schedule and your summer schedule? Build a rhythm for your household by anchoring an activity to a day of the week. For example, in our family Monday is Catch-up Day where I tackle household things that need tending, Tuesday is Library, Wednesday is Nature Day, etc. When planning your daily rhythms and routines, remember rhythms change with the time of year, our season in life, our current responsibilities and needs. Every season may look different. What’s worked before may not work this season and that’s okay. Give yourself permission to adapt and change things as needed. Rhythms and routines are to be for our benefit, not chain us to a schedule. What’s the natural flow of our day right now? What areas could use more structure? Less structure? What do I want my day to look like? What’s realistic? What might benefit my family and household? What are you saying yes to? What are you saying no to? You could call this self-care or mother culture. How are you going to cultivate and nourish yourself this summer? Maybe it’s as simple as creating your own morning routine or finally committing to that yoga practice. It could be taking short adventures with your kids to appease your own adventurous spirit. Perhaps it’s tackling your book list or getting back to your own creative practices (writing, painting, etc). Build in some time this summer to do what makes you feel alive and in doing so, you’ll be more ready and full to be present and bring life to your children. Want to decorate your space with a little summer love + inspiration? 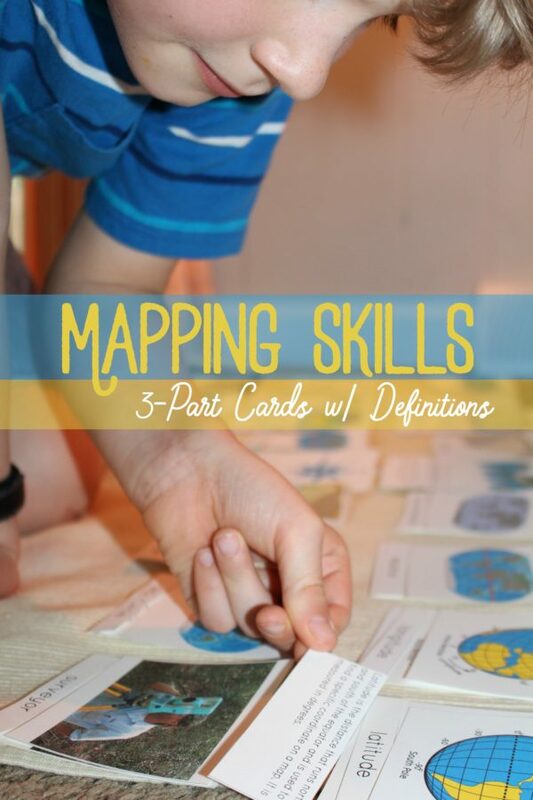 We’d love to see how you use these printables and what you’re doing this summer. Share your summer space on Instagram with #OMHSummer. 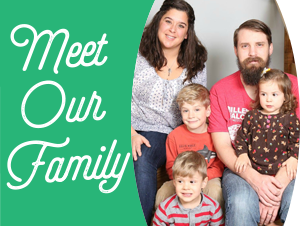 You can see our journey at #ourmontessorihome and #OMHSummer! In the spring, after we finished our basic land and water forms study we moved on to learning different mapping skills. 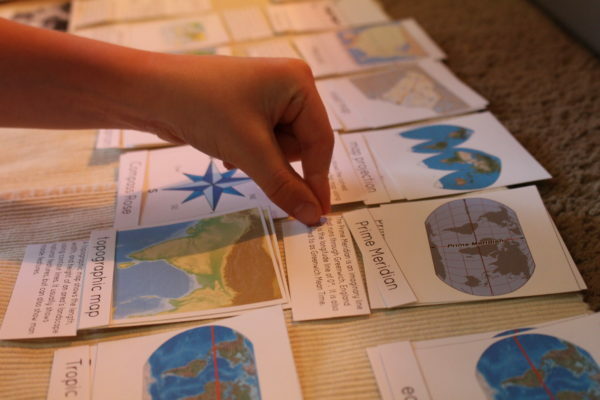 To help learn about the different types of maps, what a surveyor and cartographer do, how to read a compass, and the difference between longitude and latitude I made our own 3-part cards to go along with our study. These cards are a little different in that they’re actually 4-part cards. 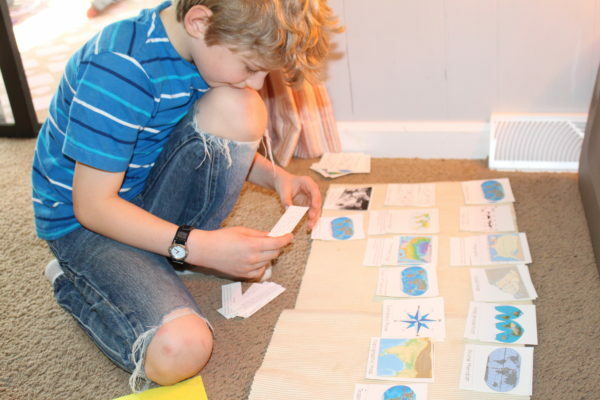 Once a child moves on into lower elementary, the definition is added to each picture and label to help deepen the child’s understanding of the term and its concept. So here we have the the main card with picture and name, the picture, the word card label, and then the definition. We’re upgrading to nicer art supplies little by little. Sorry Crayola and store brands. First up, colored pencils and watercolor paints. I’m tired of pencil lead that breaks as soon as it’s sharpened. Colored pencils and watercolors…excuse me, watercolor cakes. 3. Shopping Back to School supplies on Amazon. I have four kids. Shopping with all of them is no longer fun, even when everyone is on their best behavior and no one has to go to the bathroom when we have a cart full on the opposite side of the store. Amazon is where it’s at. At the end of the year, I made a list of all the supplies I thought we would need based on what we used and priced it on Amazon. This week I managed to get to Target with just the baby (priceless!) and did a bird’s eye view of school supplies prices. For the quantities I was looking for (and I don’t want to have to go buy construction paper or gluesticks every other month…or printer ink), Amazon was much cheaper. The only thing that was a better price were composition notebooks. Fifty cents is hard to beat. I don’t have the time or energy to pick up supplies at five different stores (with all the kids in tow..sounds like a blast! ), so I’m ordering them online and having them mailed to me. That’s going to be one big box. I can already imagine the rocket ships, houses, and forts that are going to be built. My cheap side reels a bit at the prices of electric pencil sharpeners and I’m tempted to say we’ll just keep the small manual ones, but I also know my kids hate sharpening pencils. Only Olivia still finds it appealing and I’d rather not get carpal tunnel in my hands from sharpening 50 colored pencils. I’m taking the plunge and hoping the reviews are right. We’ll see. It’s so easy for me to lose the big picture focus in home educating and get bogged down in scope and sequences, how the day or week turned out horribly, all the things I want to do that we aren’t doing, and on and on. My goal is to listen to at least one inspiring and encouraging talk (or podcast) on homeschooling and/or motherhood a week to help me stay focused. I’m starting with the conference audio from the Wild + Free conferences. 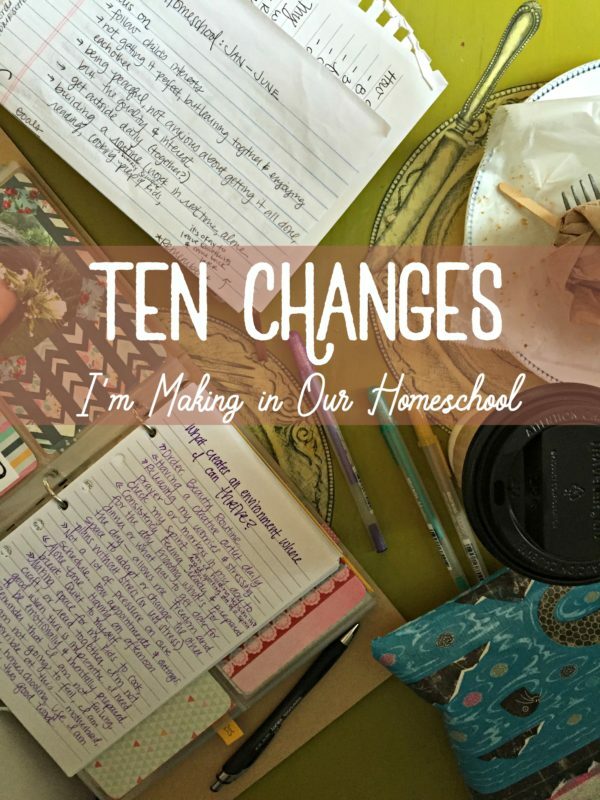 I’ve listened to them before and have a few favorite homeschool mom speakers (Toni Weber and Sarah MacKenzie are a few). You can find them in the Wild + Free content bundles (sample one here). 6. Scheduling Teacher Work Days. Multiple times last year I’d need more time to prep materials or I’d reach my end mentally and emotionally and needed a good attitude adjustment or perspective change, but because we took 3 weeks off of school when Victoria was born and I didn’t want to do be doing school through June we kept plugging away to meet our 180 days. This year I’m loosely scheduling in teacher work days and not the kind where the TV babysits and I’m in the other room (though that happens too). I’m getting a babysitter and taking at least 5 hours out of the house to refuel, focus, plan, prep, and educate myself. Traditional teachers need that and so do homeschool moms! I wanted to get in a regular read aloud habit, and for a month or two we were pretty consistent, but I was slow to start and it fell away because I often thought it was taking too much time from the rest of our school day. But the times we did have morning read aloud, the kids were more engaged, eager to participate, kinder to each other…it kind of did this magical thing and put us all at ease. I know it’s a buzzword these days, but for good reason. A lot of women, and moms especially, don’t take care of themselves in some basic and necessary ways. In the last eight years, I’ve had three babies, three miscarriages, three major moves, one minor move, depression, a few years where my husband worked 2nd shift full time and went to grad school on top of the regular day in/day out challenges and responsibilities I’ve developed a lot of bad habits and coping techniques to just make it through the days. I’m focusing on my eating habits, getting back into my yoga and kettle bell routine, going to bed before midnight, and making that optometrist appointment I’ve needed since April. And coming to terms that results from the effort of these things (like working out after the kids go to bed instead of just watching Gilmore Girls) will take time. Ugh. I mean, Yay for self-growth! I did it. 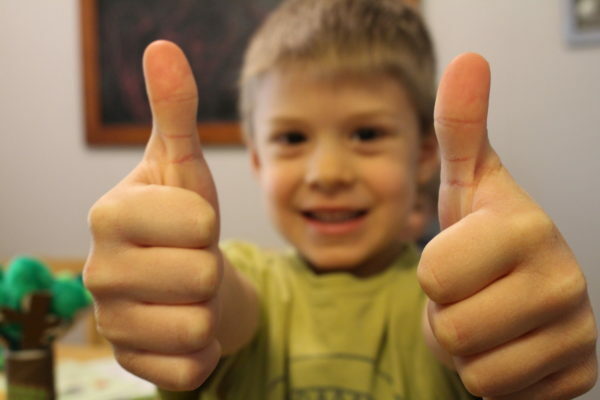 I bought the North American Montessori Center’s Lower Elementary curriculum. It was a big chunk of change, but I feel good about the decision. I spent a lot of time last year reading up on the lower elementary scope and sequence, finding lessons, trying to piece together the gaps in my self-education, and stressing (so much stress! Just ask my husband.). I spent three years teaching in a primary classroom and am comfortable with the primary lessons and did the training for infant/toddler with NAMC, but there were spots in the lower elementary scope and sequence I just wasn’t sure about and couldn’t find consistent and cohesive reliable resources. After researching homeschooling costs for non-Montessori families spend, talking with a friend, and also my husband, the cost over the years I’ll use it with each child (nine years in all) is reasonable. Hopefully, I’ll be able to go back and do the training as well. I’m remembering the big picture—building a love for life long learning and exploration. We don’t have to learn it all now. It’s okay to leave something and come back to it later. Prize the relationship first. Big picture, whole person. That ideal homeschool I have in my head, the look of free-flowing and easy going comes with routine, patience, and practice. Hour by hour, day by day, we’ll build it together. What’s on your list to change this year? We’ve been fans of Kiwi Co for awhile now and recently the people at Kiwi Crate reached out to us and asked if we’d be interested in reviewing a Koala Crate. These little faces were excited to get a box all their own. What’s the difference between Kiwi Crate & Koala Crate? 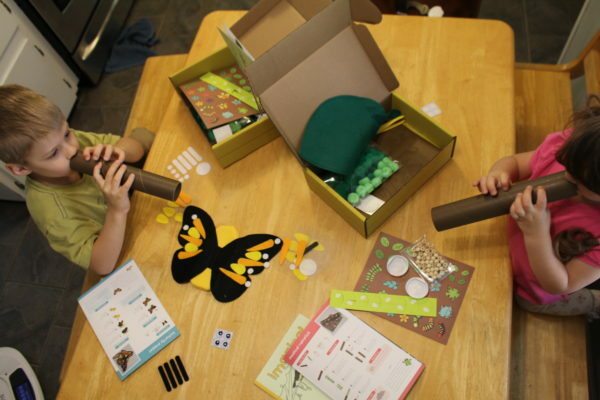 #1 – Kiwi Crate is geared toward children 5 to 8 years old, while Koala Crate is aimed at children 3 to 4 years old. When our Kiwi Crate box arrives, we generally do the activities together. Joey (age 7) is really the only one who can do the Kiwi Crate independently. 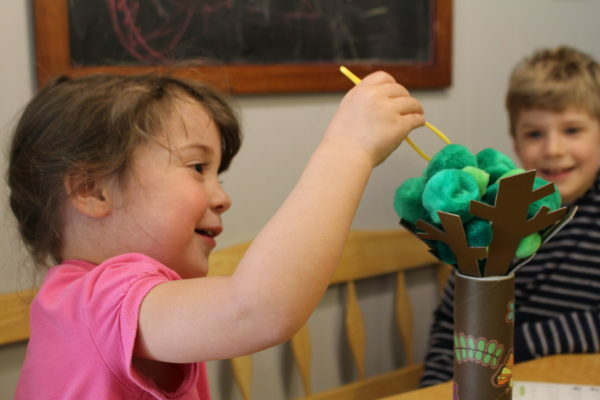 All the kids have fun, but Kiwi Crate is much more hands on for mom with the littles. 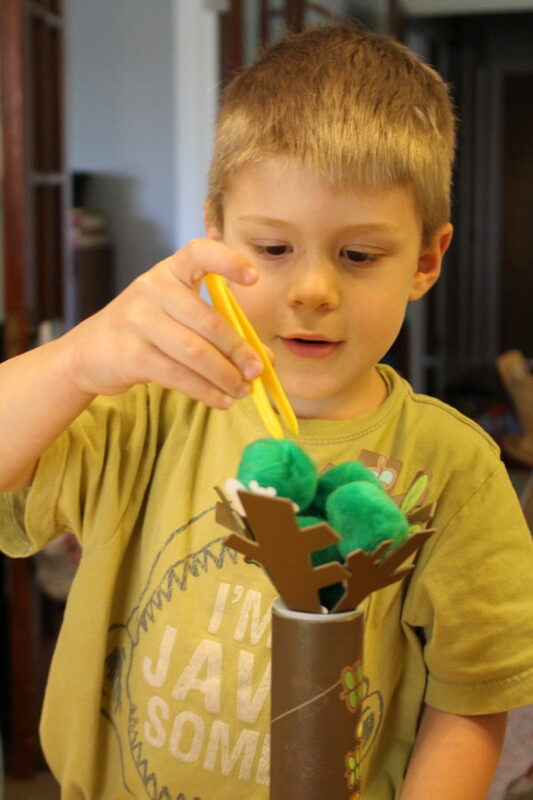 With the Rainforest Koala Crate, Otto (age 5) was able to complete the crafts independently. The step-by-step directions were written and paired with pictures for each step. Olivia (age 3) enjoyed building the crafts and playing the tree game, but did need some help with assembly. 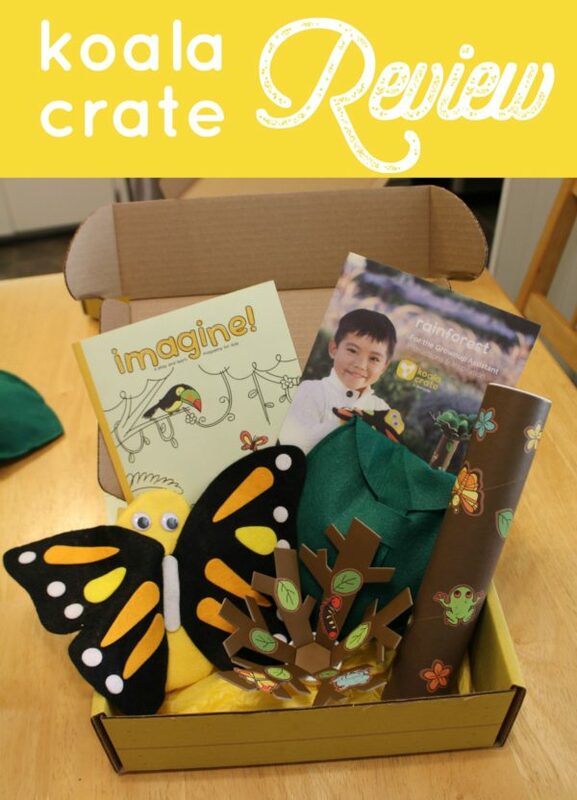 #2 – Koala Crate comes with its own magazine called Imagine!. 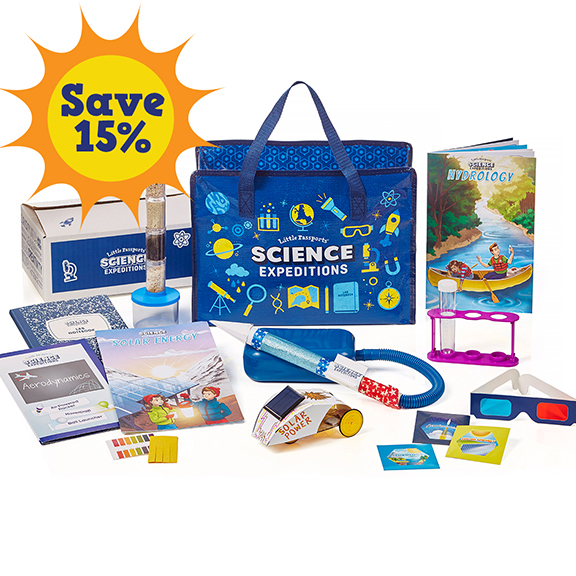 Kiwi Crate has its play and learn magazine, Explore! Imagine is much shorter than its Kiwi Crate equivalent. There is still a story, a page with facts about rainforests, directions for an extra craft, recommended books on the topic, and a ‘Find the Difference’ picture game. Joey was quick to point out that there are a lot more activities to draw, make, and experiments to try in the Explore magazine. This was a little disappointing, since Olivia’s favorite part of the Kiwi Crate magazines is to go back through and play the games and draw through the different activities. I was a little surprised there wasn’t more activities or even coloring pages in Imagine. Everything you need is right in the box. It’s still the same great quality of materials, as well as enough pieces leftover to use later. The directions are simple, clear, and concise. They still need a grownup. Yep. It’s not a babysitter in a box. 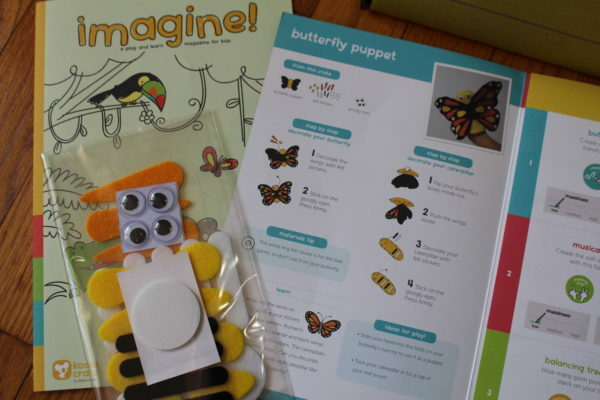 The first project was a butterfly puppet. 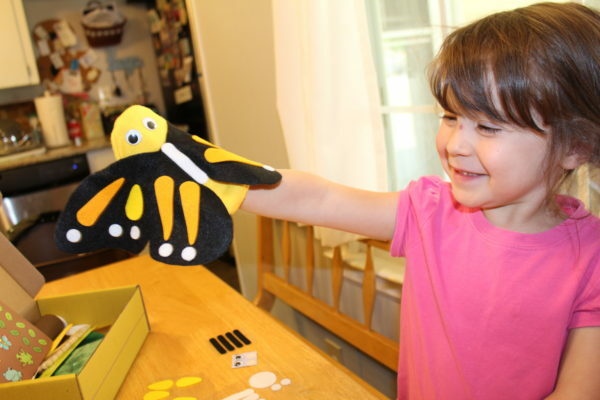 The cool thing about this puppet is that you can fold the wings in and flip the puppet inside out to reveal the caterpillar side! Next, they put together their own musical rainstick. They weren’t quite sure what a rainstick was and kept trying to shake it. 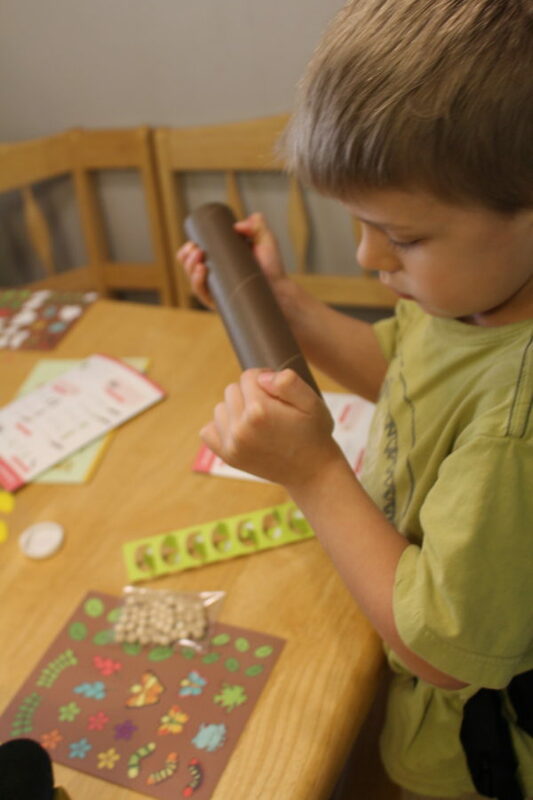 Once they finished making their rainsticks, they assembled the pieces to the balancing tree game. This is where they had the most fun. I love the quality, creativity, and design of their products. Seriously, I’m a sucker for good design and continuity. I love that it’s accessible for my non-readers. I do wish the Imagine magazine had more of the good stuff the Explore magazine has. Overall, the Koala Crate is a great product. Since we already have a Kiwi Crate subscription, I’m not sure we’d do both (a monthly subscription is $19.95/mo or less depending on the type of subscription). 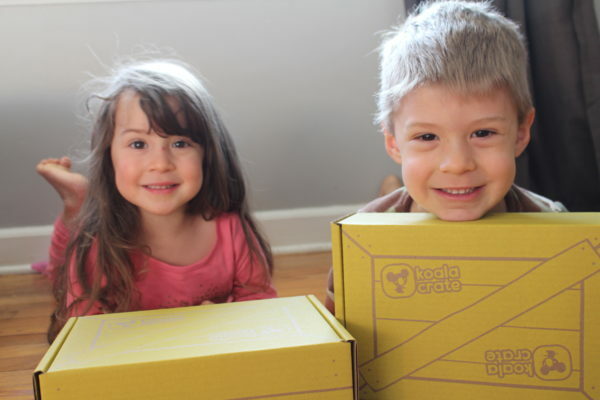 However, if I was looking at a craft subscription service geared to a 3 to 5 year old Koala Crate would be my choice. Want to try Koala Crate? 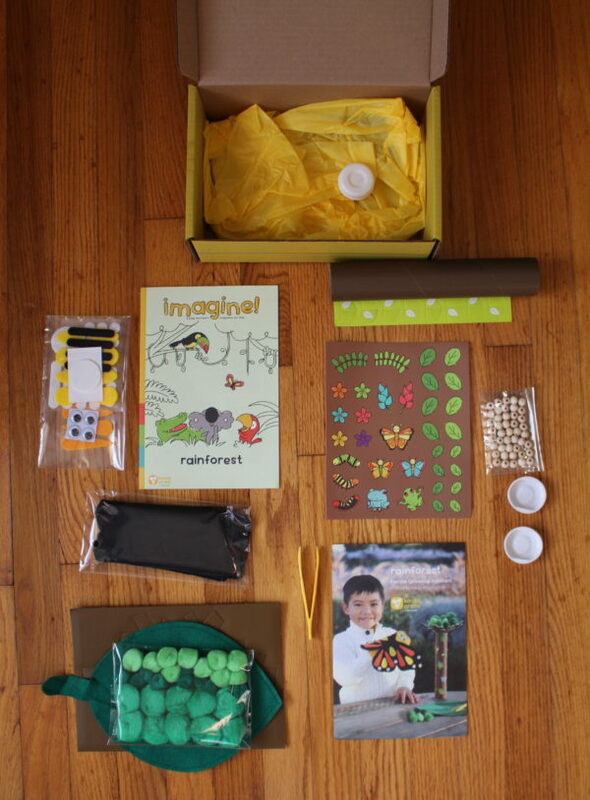 Want a peek inside a Kiwi Crate? Check out our review for Fun with Flight.